Games and play are a great way to help kids develop skills, learn to manage their emotions, and develop resilience. Disguised as fun, they can force kids to face down challenges, and struggle through adversity. It’s a topic my friend Dr. Kristen Milliken, of Your ADHD Life, writes about in her book, PlayDHD. With Kristen’s book in mind, I recently ran a scavenger hunt for my twin boys. In this case, it was the kind where they started with one clue, which led to another, and then another, and so on, until they got to the treasure at the end – a small box containing Legos, a magic eight ball, gummies, and a book. It was a fun thing to develop, and it was clear that it made my boys feel valued and loved. My thinking as developed it, as well as the methodology for setting things up is below. I wanted to challenge their problem solving skills, but not so much that things became so frustrating that it wasn’t fun. To do this, I set up each scavenger hunt clue as a riddles written in the first person. My boys are in upper elementary school, at the age where they can handle reading maps, but don’t get much opportunity to do so. I want them exposed to that skill, so I made four out of the twelve clues in the hunt maps. Three of the maps they got at the location they had to use it, and one they had to figure out the location from the map and then use the map to determine where in the location to look for the next clue. The maps ranged from a satellite photo with an “X” on it, to a minimalist sketch of local streets. They navigated each of them, but I did have to teach them how to hold maps to better orient themselves as they used them. One I intentionally labeled and drew so that, if you were orienting it correctly, the words would be upside down. Self advocating, and talking to strangers is a skill kids have to develop. To that end, I placed some of the clues in locations where this could be practiced. I went to our town library, a breakfast joint we frequent, and our local Y, and asked people at each location to hold the clues for my guys. Luckily, they all agreed. The clues had already been made. Note – the breakfast joint was busy when I got there, so rather than just ask them to hold the clue, I ordered muffins for the boys, and an egg sandwich for myself. I then asked them to put the clue in the bag, paid for it all, and told them we’d be back to pick it all up when the boys got to that clue. When the boys got there, I sent them in by themselves to get the food, while ran an errand at the bank. Independence! Logic and problem solving is also a worthwhile and fun challenge. To that end, I wrote two clues in a simple cypher (A=Z, B=Y, etc…) In order to get the clues, the boys had to break the code and then translate the riddle. I did this for the first clue, and the one at the Y. The reason being that both were inside, so I didn’t have to risk the paper getting wet. I also included a pencil in the envelope with the Y’s riddle in it so the boys could more easily decipher the code. I mentioned that my main motivation for this activity was to give the boys a fun memory. Closely related to that was a desire to help them remember past good times. The boys have been on a bit of a negative kick lately, and I wanted to remind them that we’ve done some pretty cools tuff just in our regular travels around town. To that end, I tied many of the clues to places we frequently have fun in, have been fun in the past, or are tied to our common travels. I revealed this about 1/2 of the way through the hunt, to help them solve one of the riddles. Suddenly our travels from one clue to the next became filled with their stories and recollections of the things we had done at the various places we had visited during the day. It made me feel really good to hear them talk about their memories of playing at playgrounds they had outgrown, the times we had gone out to breakfast with their grandparents and how much they enjoyed exploring and climbing on a the big rock when we took walks at the local pond. While some of these goals may make sense to you, you may very likely have other things in mind. Perhaps you want to focus more on helping your kids manage challenging situations, in that case make your clues harder to figure out, put them in places that are difficult to get to, use multiple challenging codes, or do some combination of each. Just be mindful that the hunt is supposed to be fun. I would advise against building in so much challenge that the frustration outweighs the fun. In my case, I set things up to break more toward the fun side with an eye toward setting up another one in the spring that will be more challenging. That way the fun from this one will help carry them through the next one, despite things being a bit harder. That paid off, because the weather was cold and rainy on the day we did our hunt, which made the difficult aspects all the more frustrating for them. As I mentioned, the weather report for the day we were going to do the hunt was foreboding. Rain. But, as they say, the show must go on. And honestly, I thought the rain might make the experience better for my boys. They’d, of course, like it more if it were a nice sunny day, but enduring a chilly, rainy day in November makes you feel like you’ve earned it when you get to the treasure at the end of the hunt. And that, my friends, is how resilience is built. They stepped up to the challenge like champs, and were in good spirits the whole way, even after one of them fell into a creek while looking under a bridge for the final clue. I was with my boys for most of the hunt. Largely because I wanted to make sure none of the clues were missed because they have been found and moved by someone else. I also kept a cheat sheet in the car just in case. Thankfully, none of that proved necessary. For the next scavenger hunt, I’m going to make the clues a bit more challenging. My boys solved the ones I used this time relatively easily. I also plan to use more that one code system, this time with random symbols to replace the letters, rather than the simple cypher I used this time. One of my guys, in particular, proved to be a whiz at cracking the code I used. And I plan to put more clues in the woods, with descriptive text to help them find it. I think this might add a bit more magic and mystery to the experience. Additionally, I think I may have to provide more specific location clues in some cases. (At one playground, I had taped the clue under a slide. I thought it was obvious, but it still took them almost fifteen minutes to find it, and even when they did, it was only because I ended up giving them hints.) Also, because of all the traffic we hit (a nearby highway was shut down due to an accident), the boys asked that the next one involve less driving and more walking. So I’ll factor that in as well. Overall, it was a fun experience, and it was great to follow along behind the boys as they tracked down the clues and then told me where to go next. I’m excited to do it again. Obviously, mixing fun into your interactions with your kids can go a long way toward making things more interesting. And the added dopamine boost that comes with fun and play is even more beneficial for those with ADHD. Scavenger hunts are just one approach. How do you add fun to the daily lives of your kids? Have you used it to teach them? Do you use it help them get things done? For more on ADHD and parenting, check out the ADHD Essentials podcast. For more on Play and ADHD, check out Kristen Milliken’s book PlayDHD. For more on Kirsten, check out her site, Your ADHD Life. or her episode on the podcast. It’s that time of year again. The leaves are turning, acorns litter the ground and the air is becoming chilly. ‘Tis the season of pumpkin spice. It seems like everyone is out of their minds about it. In fact, I don’t doubt that when you saw the title of this post, some small part of you got really excited by the prospect of linking pumpkin spice with Attention Deficit Hyperactivity Disorder. Why? 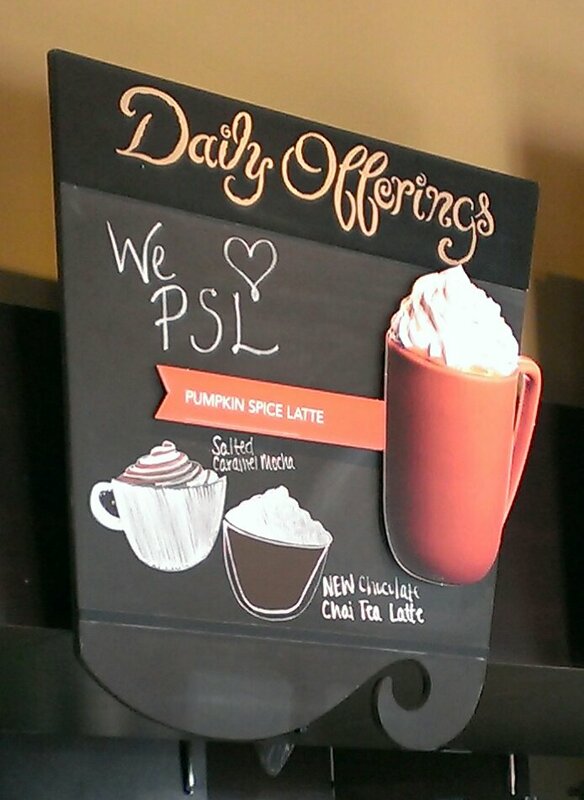 Why is pumpkin spice so exciting for so many people? Because it’s a special event. It adds an interesting twist to things that are ordinary and commonplace, like coffee, pancakes and muffins. And, it’s only available for a little while. So, what does this have to do with ADHD? The ADHD brain loves unique experiences and reward. Pumpkin spice, because of it’s limited timeframe, is a unique experience. The food it is connected to, obviously, is the reward. People with ADHD need a little “pumpkin spice” every now and then to help motivate them. Something that adds an interesting twist to an activity that has become boring and uninteresting. Just don’t keep the twist up for so long that it too becomes boring, and make it clear that the twist will not be a regular event. Keep it to a fixed timeframe as best you can. My client, Tommy, was a twelve year-old boy who was reasonably well motivated to do his chores. He got a weekly allowance that was not tied to these chores. He was expected to do his chores because was part of his responsibilities as a member of the family. He got the allowance because his parents love him and want him to learn how to manage his money. One day, his parents needed some extra help around the house – raking leaves and clearing the yard of some overgrown plants. Tommy refused to help because he didn’t think he should have to do any more work than he was already doing. His parents disagreed, and were confused because he was usually so willing to help around the house. Remembering back to some of our conversations about how Tommy sometimes needs extra motivation from an outside source, Tommy’s parents added some “pumpkin spice” to get his help. They decided to offer him a one time, ten-dollar bonus to his allowance if he spent the day helping them clear the yard. They made it clear that the bonus was only being offered because the job was so big, and that he should not expect to be paid a bonus in the future unless the project was similarly large. This extra motivation is all they needed to end the conflict over the yard work, and inspire Tommy to help. Kyle was six-years old girl when I started working with her, and she hated doing chores. Although she usually did them, everyday is a battle. It drove her parents crazy. When they asked me for advice, I recommended that they add a bit of “pumpkin spice” to the struggle. Knowing how much Kyle loves chocolate, I told them to tell her that for the next week, every time she does her chores without an argument, she would get a Hershey’s Kiss after dinner. It didn’t work perfectly, and Kyle missed out on three of her seven potential Hershey’s Kisses – twice for arguing with her parents, and once because she failed to do her chores at all. But the week ended well. Kyle’s parents made it clear that they were proud of her for doing a much better job with her chores overall, and the family battles over cleaning were less frequent in the following weeks. Ben, a fifteen year-old client, was struggling to do his homework as the school year came to a close last year. He just couldn’t seem to sit down and get started. He usually struggled a little bit in this area, but as the year wound down, things had gotten worse. In talking to both Ben and his parents about the problem, I recommended that we add a little “pumpkin spice” to the mix. Recognizing that the recent burst of nice weather might have something to do with Ben’s struggles, I advised that he work outside on the family’s deck. Ben loves being outside, and this little change helped him power through the last few weeks of school. Make sure it is unique. Keep it to a limited in time frame. Communicate clearly that it will not happen again soon. The pumpkin spice approach to motivation works best when unique challenges arise. It can be very helpful when people with ADHD go through a period of increased difficulty with motivation or productivity. Just like coffee shops and bakeries keep coming up with new uses for Autumn’s favorite flavoring, there are no limits to how pumpkin spice approach to motivation can be used. I’ve shared a few examples. Please let me know how you apply it. I’d love to hear from you. I’ve been coming across a lot of posts recently claiming that ADHD can be cured. It can’t be. Not any more than a withered limb can be cured. If you see someone claiming to be able to cure ADHD (or autism, for that matter), run the other way. They’re a charlatan and they are willing to take your money based solely on false hopes. I’ve seen claims that everything from essential oils to supplements to biofeedback can cure ADHD; none of which can. They may mitigate symptoms, but they’re no cure. The people selling them are just using the word cure to prey on the frustration and fear of those suffering from the disorder. ADHD is a neurological disorder characterized by low levels of the neurotransmitters norepinephrine and dopamine, as well as poor development of the brain’s prefrontal cortex, and executive function system. Curing it would require altering the brain and the way it produces chemicals. Despite the incredible things we’re learning about neuroplasticity, we can’t do that yet. What we can do with ADHD is manage it. In some cases, can manage it so well that it may seem like the person is so minimally impacted by their symptoms that that may seem to have been cured. They aren’t. Much like a recovering alcoholic can go years without a drink and then some random life event can cause them to return to the bottle, a person with ADHD who is managing their symptoms like a pro can easily fall off that wagon should their situation change. Marriage, the birth of a child, a death in the family, a change in job status, all of these are common triggers for ADHD. Indeed, those who get diagnosed later in life often report that they were going along just fine until one of these events threw their life into a tailspin of uncontrolled emotions, unfocused disorganization, and unremitting procrastination. So what, then, can we do to mitigate symptoms? Medication is the most scientifically backed treatment for ADHD. That said, it’s difficult to get right, and medication is too often used in solitude when it should be paired with skills training. Training the organizational, planning, and time management skills necessary to compensate for the disorder, as well as developing an awareness of how it impacts one’s life is essential to living an effective life with ADHD. I realize, however, that there are those of you who balk at the idea of medication and would prefer an alternate path. Improving diet and exercise are good ways to lessen the impact of ADHD. A diet rich in whole foods like lean meats, vegetables, fruit, nuts, and water with minimally processed foods will help a great deal. Exercising at least 30 minutes a day is another effective treatment. Intense cardio is best, but just getting moving will help. Begin wherever your fitness allows you to and go from there. One area I would caution against is supplements. The simple fact is that they are not a safe alternative to medication prescribed by a doctor. Supplements are not regulated by the FDA, and can their ingredients are often inconsistent both in terms of what is included and how much. This leads to inconsistent, and at times unsafe results for the user. An often-underestimated treatment for ADHD is simply learning more about what it is and how it works. The better you understand the disorder the easier it is to understand the sometimes-confusing behavior of those who have it, including yourself. Also, along with a better understanding of behavior, comes an increased awareness of those behaviors and what may be triggering them. Which in turn leads to a better understanding of what treatments would work best. There are many ways to learn more about ADHD. Speaking with your pediatrician, reading books, visiting websites (like this one! ), listening to podcasts and even attending seminars on the subject are all good options. Most importantly, however, is the application of that learning. We’ve already covered the importance of diet and exercise to ADHD. It’s great to know that a diet rich in whole foods and exercising 30 minutes a day will help in managing symptoms, but if you don’t make those changes, it does little good. In order to effectively manage the symptoms of ADHD, you have to be willing to not just learn but to do. Start small. Skip over the cookies at the supermarket. Buy apples instead. Take the stairs rather than the elevator. Park in the back of the lot instead of circling until you get a spot near the entrance. Little changes, compounded over time will add up to big differences in your symptoms. There is no cure for ADHD. But with effective coping strategies, there doesn’t need to be. This is it, the first post to the blog. It’s pretty exciting. Starting isn’t easy. In fact, starting is simultaneously the most basic and most challenging aspect of any project. At its core, it means taking that first step. Putting pen to paper, fingers to keyboard. Packing your gym clothes, ironing your suit. Chances are for some of you reading this, just seeing those steps put to paper caused a little burst of anxiety. That’s the challenging part of starting. When you start a new task, it doesn’t exist in a vacuum. The echoes of similar tasks that you struggled with or succeeded in throughout your life reverberate within them, making some things easy to start and others incredibly hard. This is especially true for people with ADHD. How do you get past this emotional barrier? First, realize that it’s there. Once you know you’re dealing with strong emotions, it’ easier to manage them. Owning up to past mistakes and the way they affect your motivation is an important step when trying to move beyond them. Next, you have to fully cement in your mind the importance of the task ahead. Why is it important? Often, the importance lies in what will happen if you do or do not engage in the task at hand. Looking at the consequences of doing or not doing the task can be a powerful motivator. For some people negative consequences will push them to act, for others looking at the positive effects of taking the action will provide the needed motivation. Get to know which one works best for you, if you don’t already know, and use it. What happens if you don’t do it? Look at things from both a short-term and a long-term perspective. If you put it off, might there be a harsh consequence? A demotion? Damage to you reputation? Will you anger someone important to you? What opportunities will you miss out on either now or in the future? What other goals will you have to put off if you procrastinate on this task? From a more positive perspective, how will completing the task on time or early strengthen your reputation? How might your position be improved by completing the task? What opportunities will present themselves? How much easier will it be to achieve your next goal when you can ride the momentum created by successfully finishing this one? Visualizing success in this way can be hugely motivating for those with ADHD. How does visualization help with motivation? Visualization helps us to see that our goals can be accomplished. It provides us with the much needed perspective that we can succeed. People with ADHD can have difficulty transitioning. It’s usually associated with going from one activity to another, but it can also affect the transition from one emotional state to another. Visualizing success helps transition from a struggling, discouraged state to one that is motivated to tackle the task at hand. It helps shift perspective. Once you’ve got the perspective that you need, and you can feel the motivation starting, it’s time to implement strategies to help you move forward. The best way to start anything, is with the first step. Unfortunately, that first step isn’t always clear. People with ADHD tend to be very good at seeing the big picture, but not as good with the details. As a result, they often get caught up in what the end of a project will look like. This often leads to excitement about the goal, and intimidation about the road ahead. It becomes difficult to see the forest for the trees, and that crucial first step become lost in the shuffle. The best thing to do at times like this is to break the task down into small steps. Steps so small they almost seem silly. What’s the first step to getting into better shape? Going to the gym. What’s the first step to going to the gym? Driving there. What’s the first step to driving there? Getting out of your house and closing the door behind you. You get the idea. Just keep breaking the task into smaller and smaller pieces until it doesn’t seem so hard to do. You’d be amazed at how many goals start with getting out of your house and closing the door behind you. What strategies can help with taking the first step? So you’ve figured out your first step. Here are four strategies to help you take it. Set a timer. It’s that simple. Set a timer for twenty minutes, and get to work. You can do anything for twenty minutes. Just commit to it and get going. If the timer beeps and you’re in the zone, keep going. If not, take a five-minute break, reset the timer and get back to it. Repeat a necessary. Figure out your best time to work. Some people work better at night, some work better in the morning. This may very well change with the task. Mental tasks might be best for you in the morning, and physical tasks might be best in the afternoon. Determine your best time to work, and begin your most challenging tasks then. Find a buddy. A classic ADHD productivity strategy is the body double. It involves having someone in the room with you while you tackle difficult tasks. They don’t check up on you, or pressure you to do your work; they’re just there in the room with you. Effectively, their presence helps you feel like you’re getting credit for doing whatever the task is that you’re working on. Often that credit will be just enough of a motivator to get you down to business. Change your inner voice. Often, when thinking about the things we have to do, we use passive terms like “should” and “ought to”. Changing these terms to active verbs greatly improves motivation. Suddenly, a “should” becomes a “must”, and an “ought to” becomes a “must do”. What if it’s still hard to start? Sometimes you need the help of another person to get you going. Maybe you need their advice on how to break the task down. Maybe you need the accountability that comes with having another person invested in what you’re doing. That’s what an ADHD coach is for. As an ADHD coach, I help my clients move through the process of setting and accomplishing goals. I find that once I help them set their goals and get rolling, they do an excellent job of tackling the tasks in front of them. Although they may need some help along the way, often it’s at the beginning of a project that they need the most help. If you need help tackling a new project, or even an old one that you’ve been putting off for too long, e-mail me at [email protected]. I’d love to help you out.